We bought the night stand, the chest of drawers, and the bed all on the same transaction. I'm very pleased with our purchase, as the products are solidly built, and seem they will last long. The night stand doesn't come assembled, but detailed instructions are included. We felt it was not hard to put together. Overall, I highly recommend this product. 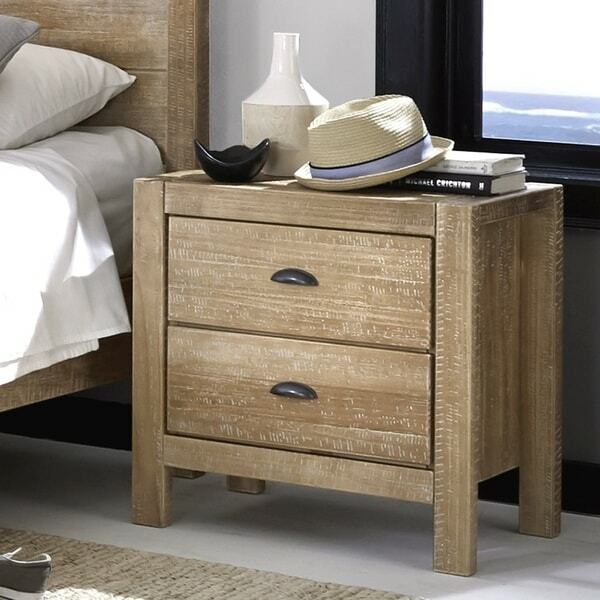 Create a charming rustic retreat with the Montauk two-drawer nightstand. A distressed, rustic design in your choice of finish effortlessly blends with current bedding and decor styles. With a solid pine wood construction, French dovetail drawers, and metal drawer glides, this sturdy yet stylish furniture piece is sure to become a fast favorite. Great finishing touch to the room! We love this little beefy side table which matches our new queen bed. Well constructed, hefty weight, nice drawer handles---we made a great choice. 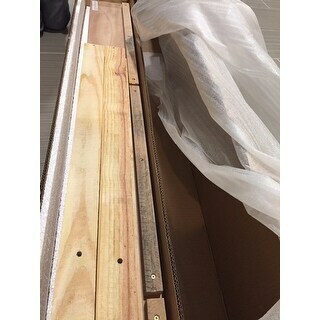 I ordered two of the Grain Wood Furniture Montauk 2-drawer Solid Wood Nightstands from Overstock and the first thing I noticed when I got them was how light the packages were. They came in two separate boxes plus they arrived well packaged quickly. The drawers operate smoothly on both of them and they are a good height in comparison to the bed. The best part about them- no assembly required. Good quality. Solid wood. Does sit lower than I had hoped but that's due to my 14 inch thick mattress. 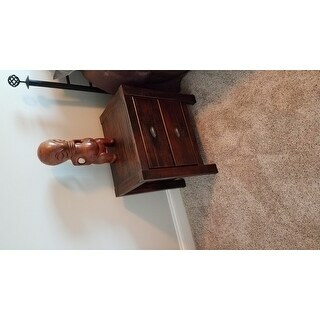 This nightstand matches the grain wood bed that I bought for my guest room. Very solid and well made. Drawers slide in and out smoothly and it is a perfect size. Has that rustic look to it and it matches almost any color. Very happy with this piece. This is very high quality, solid wood furniture. We got the gray, two nightstands and the king bed. My only problem with them is that they are painted solid gray, with brushes of white on top. From the picture and name (rustic gray) I thought the finish would be more of a gray wash over the pine. But it’s fully painted and not really rustic. 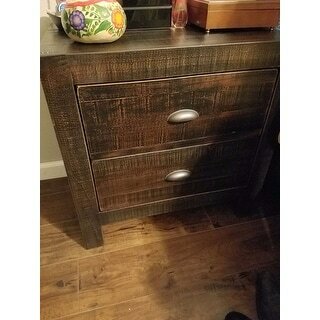 We kept it because it’s hard to find solid wood furniture for a good price and they look good, but if I had seen them in a store I might have passed them up as being not quite the finish we were looking for. 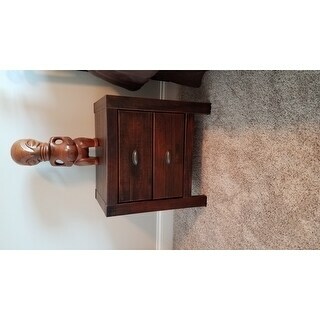 I purchased two Montauk nightstands plus the queen bed frame in the dark barnwood finish. The quality of the nightstands is high and I think the price is fair for the quality. Except for the back, the nightstand is made of solid wood. I am disappointed with the finish. The photos make the wood look uniformly dark. The finish seems to be an orange undercoat with a darker overcoat, with some of the orange showing through to make it look rustic. I would have much preferred a solid dark finish like the photo. If that had been the case, I would have been fully satisfied with the purchase. If you are looking for a more rustic, dual-toned finish, you will probably be happy with the purchase. There were a few imperfections on the headboard and one nightstand. They are pretty minor but I think the quality control could have been just a little better. Overall, I was happy enough to keep the set and think it looks nice in one of our guest rooms. Wood density (Brazilian) is light & drawers aren't English dovetail joints as advertised. Quality is good for the price, but not Restoration HW quality. This night stand is built very well. It is very sturdy and the drawers are deeper than I expected. The Barnwood color is closer to a dark espresso. Other than that it was exactly what I was looking for. 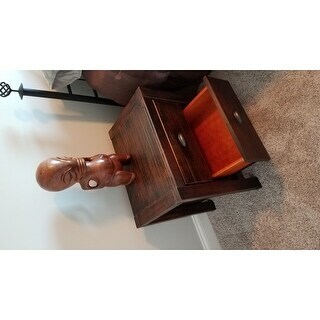 These chests are solid, attractive, the drawer glides are a dream. They are a good size; the drawers are small, but adequate. Arrived with mold growing on it. Arrived with mold growing on it. Had to return it. The furniture was attractive enough, but it also had a terrible chemical smell which filled the entire room. Overstock did not issue the proper number of tags so UPS only picked up some of the boxes. I spent so much time on the phone trying to resolve this. Complete fiasco. Meanwhile, the moldy furniture was contaminating my apartment! I bought two of these to match the bed (which comes with its own set of problems). They arrive pre-assembled and absolutely smothered in styrofoam. I wish they'd use a different packing material but it seems these nightstands really need the support. One of the units arrived undamaged but the other one looked like someone had kicked one of the drawers in. 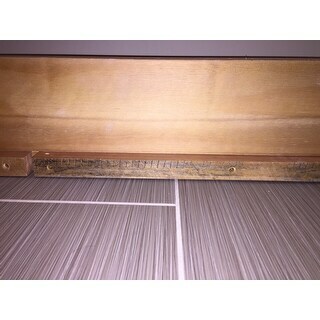 The front panel of the drawer was shattered, and the drawer had been knocked inside the cabinet and off the runner. The packaging didn't seem to be damaged. Assuming the wood wasn't already split or cracked, this doesn't reflect well on the quality of the piece. I don't know whether it was humidity/temperature changes or trauma, but if the item was damaged after being put under stress that didn't cause visible damage to the cardboard box it came in, it doesn't speak well to the manufacturing quality. 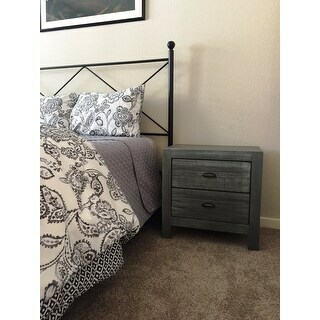 We purchased the grey nightstand and absolutely love it. It's not heavy despite being real wood, and it was a lot wider and deeper than I thought, making it great for clothes storage. The delivery was easy and on time. Packaging was not wasteful. Really impressed with the entire process and the product. Beautiful nightstands. 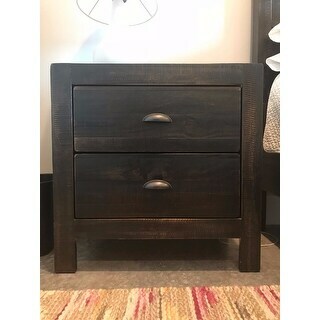 My husband has become a "pro" at putting together Overstock furniture lately since we just moved and he said these nightstands were an actual detailed build (i.e. he had to consult directions). We got the barn wood finish and love them. The drawers open smoothly and there's lots of storage. Great overall! Inspite of a prior review, this does not come assembled. I love these. Very easy assembly in that they only require a screwdriver and a hammer. Everything else is included. I put them together by myself in about 45 mins, and they look amazing. So far I don't see anything cheap about them - I'd say this is a good buy. I bought these nightstands for a kids room and they look super cute. They are a bit shorter than I was expecting, so make sure to look at the dimensions before you purchase. They are high quality though and I wouldn't hesitate to purchase them! 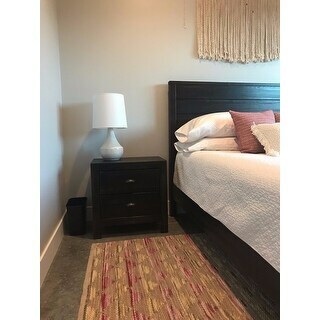 These nightstands are fairly study, but they are a darker wood than the bedframe that was suppose to match. Pluse, they have a junky light wood back and insides. Overall though, they look good on the outside and seem like they will last awhile. Just love this solid wood set! Bought the white! Solid, sturdy nightstands made of real wood. Nice color. A little shorter than I was expecting, but true to the measurements listed. Easily assembled, but took 1.5-2 hours. "Does this nightstand arrive in one box?" Yes, this comes in one box, but assembly is required. "Is the color for the rustic off white comparable to the distressed white on the **** site for the castagnier bedroom set in distressed white? Your night stands fit my room for the size I need for tgat set and the set is similar. I just want to make sure the white color is the same. Pleas help!" "When will driftwood be available?" This should be available by the end of next week. "are the handles of the nightstand removable if you wanted to replace them with a different handle?" The hardware can be removed however, we recommend measuring to make sure your replacement knobs will match the existing holes the nightstands already has. "what is the color of the handles on this?" It is a muted gray. I would classify it as an oil rubbed bronze. "How can I get on the email list for when the Rustic Grey Bed and Nightstand are restocked?" Unfortunately, we do not have an estimated restock date set. We recommend signing up for email alerts. Once the item has been restocked, you will receive an email notification. We apologize for any inconvenience. "Are there plans to restock on the Driftwood finish in the next few weeks, which has just gone out of stock? If not I can pick up somewhere else but would like to buy here." 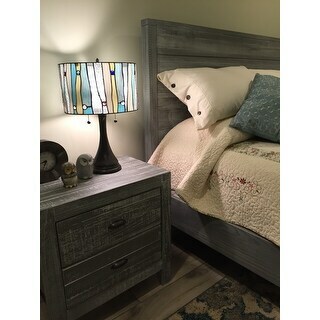 We do not know if the driftwood finish nightstand will be restocked.